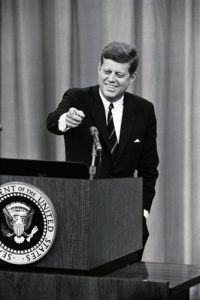 John F. Kennedy was the first president to hold a press conference on television. George Washington was the only American president to be unanimously elected. Chester A. Arthur was nicknamed “Elegant Arthur” because of his fashion sense. The Presidential Election of 1800 between John Adams and Thomas Jefferson was one of only two elections that resulted in the House of Representatives deciding who would be President of the United States. It was also the only time where there was a tie for President in the Electoral College. Although it wasn’t a tie, the House of Representatives also had to decide the President in the election of 1824, between Adams son John Quincy Adams, and Andrew Jackson, when no candidate reached the required majority of electoral votes. John Adams and Thomas Jefferson both died on the 50th Anniversary of the Declaration of Independence in 1826. Not knowing that Thomas Jefferson has already passed John Adams was quoted as saying “Jefferson survives,” when he whispered his last words. William McKinley was the first president to campaign by telephone. Franklin Pierce gave his 3,319-word inaugural address from memory, without the aid of notes. Lyndon B. Johnson was the first American president to name an African American to his cabinet. James Monroe was wounded during the American Revolution. When Millard Fillmore moved into the White House, it didn’t have a Bible. He and his wife, Abigail, installed the first library. John Quincy Adams dug the first spade of dirt near Little Falls to begin the construction of the Chesapeake & Ohio Canal on July 4, 1828. Andrew Jackson was the first president to ride a railroad train. Barack Obama collects Spiderman and Conan the Barbarian comic books. Zachary Taylor received his nomination for presidency late because he refused all postage due correspondences. Thomas Jefferson wrote his own epitaph never mentioning that he served as president. His epitaph read, “Author of the Declaration of American Independence, Author of the Statute of Virginia for Religious Freedom and the Father of the University of Virginia. Franklin D. Roosevelt is the only American president to be elected four times. 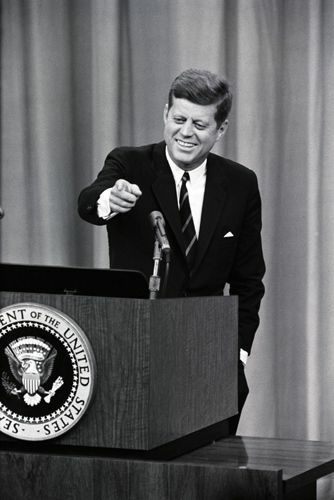 After his service, the 22nd Amendment ratified in 1951, limited the presidential office to two terms. Abraham Lincoln was a man of perseverance. Before Lincoln’s election as the 16th president of the United States he failed as a business man, storekeeper, and farmer. He also failed in his first attempt to obtain political office, when he sought the office of speaker, in his first attempt to go to Congress, when he sought the appointment to the United States Land Office, when he ran for the United States Senate and when friends sought for him the nomination for the vice-presidency in 1856. James K. Polk fulfilled all his campaign promises. During his administration Polk acquired California from Mexico, settled the Oregon dispute, lowered tariffs, established a sub-treasury, and retired from office after one term. Chester A. Arthur enjoyed walking at night and seldom went to bed before 2 a.m.
Lyndon B. Johnson was the only president to take the oath of office from a female official, Judge Sarah T. Hughes. Harry S. Truman use to get up at 5 o’clock in the morning to practice the piano for two hours. Zachary Taylor was the second president to die in office. Taylor spent July 4, 1850, at a ceremony at the Washington Monument. He became ill from the heat and died five days later of intestinal ailments. Recently, his body was exhumed because some believed he was poisoned, but this was proved to be false. William Taft, who weighed 332 pounds, got stuck in the White House bathtub the first time he used it. A larger one was ordered. The term “O.K.” is credited to Martin Van Buren who was raised in Kinderhook, New York. After he went into politics, Van Buren became known as “Old Kinderhook.” Soon people were using the term O.K. referring to Van Buren and the word “okay” was derived. William Henry Harrison served the shortest presidency, dying just 32 days after he was elected..
Calvin Coolidge refused to use the telephone while in office. Ulysses S. Grant established Yellowstone as the nation’s first national park on March 1, 1872. Grover Cleveland personally answered the White House phone. John Tyler was the first vice president to ascend to the presidency upon the death of a president. He did not make an inaugural address, and he never ran for the office of the Presidency. Herbert Hoover approved “The Star-Spangled Banner” as the national anthem. Calvin Coolidge lighted the first national Christmas tree in 1923 on the White House lawn. George Washington was the only president who did not represent a political party. Jimmy Carter studied nuclear physics at Annapolis. Harry S. Truman’s mother, a Confederate sympathizer, refused to sleep in Lincoln’s bed during a White House visit. George W. Bush was a pilot in the Texas Air National Guard from 1968 until 1973. George H.W. 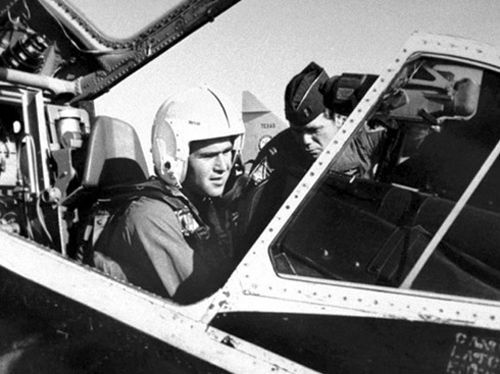 Bush is distantly related to Presidents Franklin Pierce, Abraham Lincoln, Theodore Roosevelt, Gerald Ford, Benedict Arnold, Marilyn Monroe, and Winston Churchill. Andrew Johnson was buried beneath a willow tree that he planted. His head rests on a copy of the Constitution. Thomas Jefferson was the first president to shake hands with guests. Previously people bowed to Presidents. Jefferson’s library of 6,000 books was purchased for $ 23.950 and formed the basis of the Library of Congress. At his inauguration, George Washington had only one tooth. At various times he wore dentures made of human teeth, animal teeth, ivory or even lead. Never wood. Ulysses S. Grant was the first president to run against a woman candidate, Virginia Woodhull the nominee of the “Equal Rights Party” in 1872. Warren Harding was the first president to speak over the radio. Jimmy Carter is a speed reader, having been recorded reading 2,000 words per minute. Franklin Pierce was the only president to have no turnover in his cabinet. 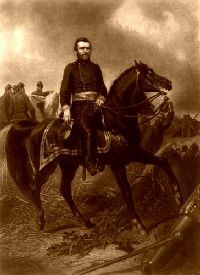 Ulysses S. Grant was the first president to view the Pacific Ocean (1852).